The Nobel Peace Prize winner returned to her home country Thursday along with her father and younger brother. Malala Yousafzai is back in Pakistan for the first time since she was shot in the head by Taliban militants six years ago. She met with the prime minister in Islamabad and later gave an emotional speech at his residence. 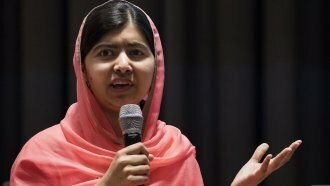 Malala was only 14 when she was shot in 2012. She was transported abroad for medical treatment and hasn't been back since. Many of the details of her trip are being kept under wraps for security reasons. But an unnamed family member told NBC she won't visit the Swat Valley, which is where the shooting took place.